Bishop Joel Johnson, Rabbi Peter Hyman and Temple B’nai Israel President Frank Menditch sign an authorization to sell Chametz. The Passover ritual temporarily transfers ownership of leavened food to a Gentile. EASTON — In an age-old ritual, Rabbi Peter Hyman on Thursday, April 13, sold chametz, food not acceptable during Passover, to Bishop Joel Marcus Johnson for $1 until the holiday ends. Although Passover began at sundown Monday, April 10, and ends the evening of Tuesday, April 18, the transfer is “symbolic, but it has great importance,” Johnson said. ”Chametz refers to food containing any amount of wheat, barley, rye, oats, and spelt, that has leavened, or ‘puffed up,’” according to ReformJudaism.org. 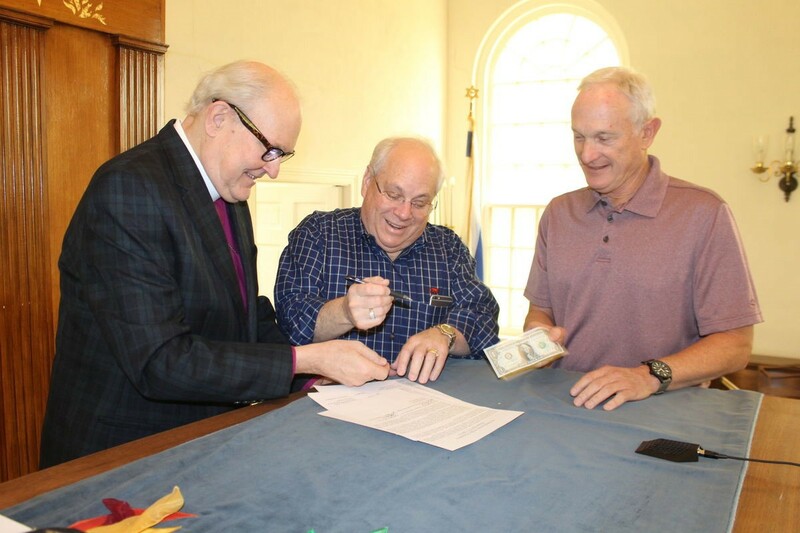 Hyman, who leads Temple B’nai Israel in Easton, where the symbolic transfer took place, and Johnson, retired Anglican Bishop of the Chesapeake, signed an “Authorization to Sell Chametz Passover 5777 (2017).” The president of the synagogue, Frank Menditch, also signed. According to the authorization, which had the serious wording and tone of a legal contract, the chametz is sold to a non-Jew. The legal language is “taken right out of the classical texts — the Talmud and rabbinical texts,” Hyman said. This is the eighth year the clergymen have participated in the Passover tradition together. Though it was a legal transfer, the two friends were lighthearted as they signed the papers. “I made sure I ironed this dollar bill,” Johnson said. “During Passover we eat matzah, or unleavened bread, and avoid eating chametz, to remember our past and celebrate our freedom,” the website states.